Android File Transfer Mac is a powerful sync tool that allows syncing data on Mac with any Android devices you own (phones or tablets running Android OS 3.x-6.x).Android File Transfer Mac is offered in two editions - Free and Expert.With Android File Transfer Mac Free edition you can sync contacts and calendars between Android and Mac. 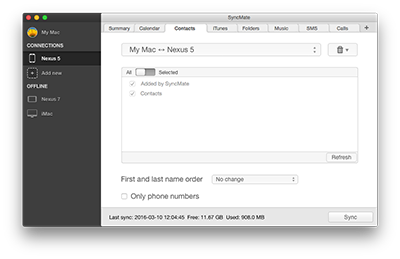 No need to create events or contacts twice - in Android device and on Mac - just sync them with Android File Transfer Mac.While Free edition covers basics, Expert edition provides you with wider range of sync options.With Android File Transfer Mac Expert edition you can sync music, playlists, images, videos, folders with files, bookmarks between your Android device and Mac. Android File Transfer Mac Expert edition allows managing Android SMS on Mac: reading, sending (creating new messages or replying to received ones), exporting messages, removing chats and search through messages.Moreover, Android File Transfer Mac allows mounting Android devices as Mac disks and browsing their content (internal and external) in Finder.Android File Transfer Mac is compatible with Mac OS X 10.8.5 and later.Besides mentioned above Android devices Android File Transfer Mac allows syncing data on Mac with iOS devices, online storages (Google, Dropbox, iCloud), Windows services (Outlook, Office 365 Home and Business accounts), any mounted devices and MTP devices.